Contents: 2 DVDs and manual shipped to you. online multiple-choice test. Contents: 2 DVDs, manual and workbook with multiple-choice test shipped to you. 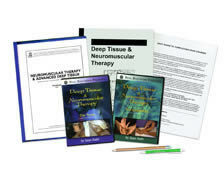 Already own the Deep Tissue & Neuromuscular Therapy Torso or Extremities DVD? Call us at 1-800-364-5722, 9am to 5pm, to discuss your enrollment options. Based on the work of Drs. Janet Travell and Raymond Nimmo, these techniques are appropriate for medical massage as well as sports massage applications. In this video- and text-based course, you will learn how to: alleviate pain with 100 highly effective neuromuscular techniques, assess injuries, evaluate and balance posture, identify 50 trigger points and recognize referral pain patterns, stretch muscle fibers, release joints in a plane of motion, apply focused friction. For clearer understanding, video demonstrations include computerized visuals and clay models of individual muscles, and the course manual and quick reference handbooks review and reinforce the video material. In the Torso video (77 minutes plus 17 page handbook), you will see 53 techniques demonstrated (covering 32 muscles, 29 trigger points). In the Extremities video (55 minutes plus 22 page handbook), you will see 47 techniques demonstrated (covering 30 muscles, 22 trigger points). Excellent course. I would highly recommend to any massage therapist who wants a clear, precise and interesting course for CEUs. Thank you! The material was consistently well presented with good background information and good use of animation models and visuals. I also appreciated the locations by landmarks, which made practice easier. I really like the challenge that this course offers. It is very detailed and highly structured, which helps me keep focused on the information. The study guide is easy to understand and practical. I especially appreciate the ROM test information and the breakdown of referral patterns in each section. Overall, the course is a must for therapists who want to learn more about deep tissue and neuromuscular therapy. The video presentation was wonderful, clear and understandable. Very detailed and informative, great reference for addressing issues commonly presented with. I read the content and viewed the videos every day for at least one hour. This was a very valuable course and covered much of what I learned in massage school. I took a great deal of time and care in watching the video, rewatching while reading the text as I worked on my printed test. I found this process very helpful. One could go through the material quickly just looking for answers, but this was not my goal. I found Sean Riehl extremely knowledgeable and engaging. I throughly enjoyed this course. I am glad I chose to take it because it helped me become a better therapist. I enjoy treating the cause of the pain rather then where it hurts. This course teaches that. Pleasantly surprised at the quality of this course. Valuable information presented in user friendly fashion. Thank you for yet again providing an excellent class. I am grateful for all the new material I have learned, and the reference material that I will continue using. And thank you to Sean Riehl for making this work accessible for other body workers. I found this course to be very enlightening and helpful. The text and DVD's will be a great resource to have in my library. Besides the practical application of NMT, it provided a great reminder about the importance of connecting with your clients, and the need to go slow and be patient. This course was real good. Learned a lot from it. Great course. Am excited to start using these techniques soon. Great course. Clear and easy to follow. enjoyed the course. Many of techniques were review but good. The DVD material is exceptional; Mr. Riehl's teaching methods are exemplary. The workbook will continue to be of value for moments when I need to 'brush up' on an approach I've not practiced in awhile. I am especially happy with the information on hand evaluation and treatment. Many thank yous! This CE course was very informative and will be very useful in my practice. It covers many common issues. This was exactly what I was looking for in furthering my education. This was a great course. I felt like the information was in depth and very comprehensive. Thank you for such a great course!! It was all very informative and interesting. I was able to understand the technique and start practicing it on friends and then clients fairly quickly after studying. Seems very effective in the treatment room. This course was great. So much to learn. I finished this course after I did the Trigger point therapy course. I think they went very good together. I have been working on several of your courses over the past year and have enjoyed and learned a lot. I will keep going over the information for a long while. Thanks. Very informative course! I look forward to using this new knowledge in my personal practice. Thanks so much! Very informative interesting.Love this site. Enjoyed the course. Learned a lot that I can use with my clients. Very informative. Thank you! Neuromuscular Therapy was a great course! I am excited to have gained new skills to help my clients. Easy review! It was interesting and very helpful! I am very pleased with the course and the content provided. The information was presented in a clear and easy to follow format. Will use service the again and recommend to fellow therapists. Awesome and to the point! Very thorough information would recommend this course highly. Wonderful source of information that I was able to use right away on my clients! Informative, easy to follow and very educational. Would recommend this to anyone looking to progress in their practice! This was a great course. I learned new techniques that I can utilize in my practice. Great first experience with the Institute. The book reinforced the DVD contents, making it easier to remember the information. The course seemed to focus a lot of Trigger point treatment. Really found information and techniques very useful for helping with many everyday issues you find in clients. Great course. Well delivered information. I will use frequently in my practice. Full of material that can help explain the purpose of certain techniques to those clients that are eager to learn the "why" of our choice techniques, based on scientific results. Sean Riehl is a very enjoyable Neuromuscular Therapy instructor and presenter. I really enjoy his calm, truly focused, and clear demeanor. I very much appreciated the pace, as well as his straightforward, very pragmatic, systematic, and efficient attitude while explaining and demonstrating specific strokes, static pressure holds, and frictioning techniques. I like the density and complexity, yet straightforward simplify of this approach to bodywork and massage and I am sure my clients are going to benefit tremendously from applying it. I am also sure that I will be referring back to and studying and committing to memory the more subtle nuances and take always from the text and video materials for years to come! I look forward to polishing and practicing all of the many techniques, and empowering clients to have more efficient, pain free movement patterns and bodily ease; to helping them zero in on relevant trigger points and release their fibrous adhesive tissue areas. Since I’ve been looking at Janet Travell’s Trigger Point manuals for more than a decade now it was good to have review and reinforcement of exact referral patterns for different muscles—and I, of course, felt compelled to keep the manuals nearby as I read through and studied the individual referral patterns and verify that Sean’s info matched up with the original source. Very gratifying to me to note that, yes, in fact the muscle referral patterns printed in this course’s manual do correspond directly, almost verbatim, to Travell’s. Made me appreciate Sean Riehl’s integrity, expertise and accuracy all the more!I’m looking forward to more deeply knowing (to wood shedding on—to borrow an old favorite expression) individual muscle’s corresponding resistance tests and getting exact protocols replicated and implemented right. I am already incorporating the test-work-retest suggestion and approach, which is really great, and serves clients’ long term pain relief & increased mobility interests and my session effectiveness goals at the same time. Great job with the DVD's that come with the course. Very informative and professional. Thanks again for having these CEU's available so I can continue to grow in knowledge and have more to offer my clients. The course was a perfect way to review all the muscles and their functions while learning new knowledge about the proper application of pressure and strokes as well as how and where to find trigger points. these techniques will absolutely improve my practice. Enjoyed this course very much. Found it very useful for my practice by adding additional techniques that I can use with my clients.